Let me begin by stating something for the record: I. Do. Not. Like. Brussels. Sprouts. 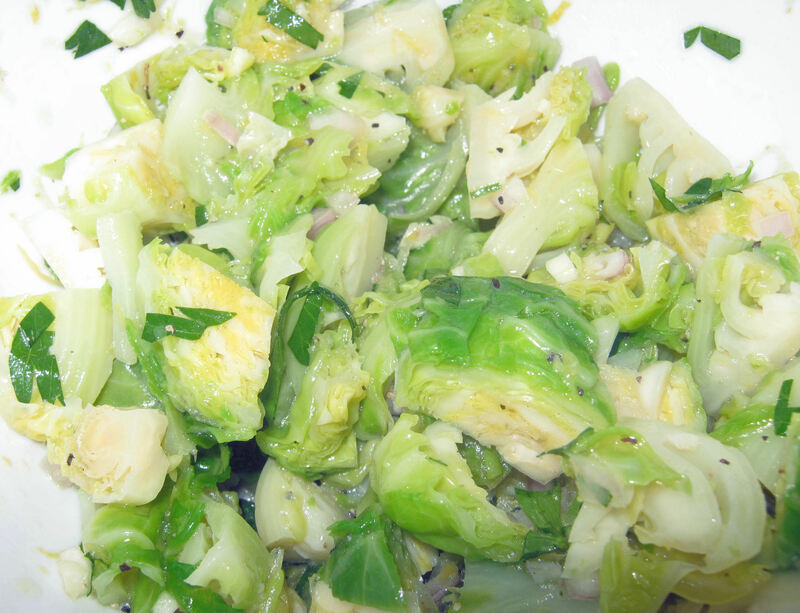 In fact, until I tried them this way, my favorite recipe for Brussels sprouts was one that came to me in a dream: “Take eight Brussels sprouts. Hide five of them.” Yes, I have pretty weird dreams. I never did figure out what to do with the remaining three sprouts, but thought that hiding most of them right away was a terrific way to start. I have had them a few times that I actually did like them, like when my husband first made them sautéed in bacon fat, steamed with a little chicken stock, and topped with crispy bacon bits. I think we liked them so much that he served them with nearly every meal, though, and then I quickly grew tired of that cooked-cabbage taste and wasn’t able to eat them again for many years. However, when some friends had us over for a summer dinner and served them this way, I fell in love with them again. Since Brussels sprouts are packed with good-for-you vitamins and nutrients, we should all really try to eat them. This recipe will please those who already love them as well as those who don’t. 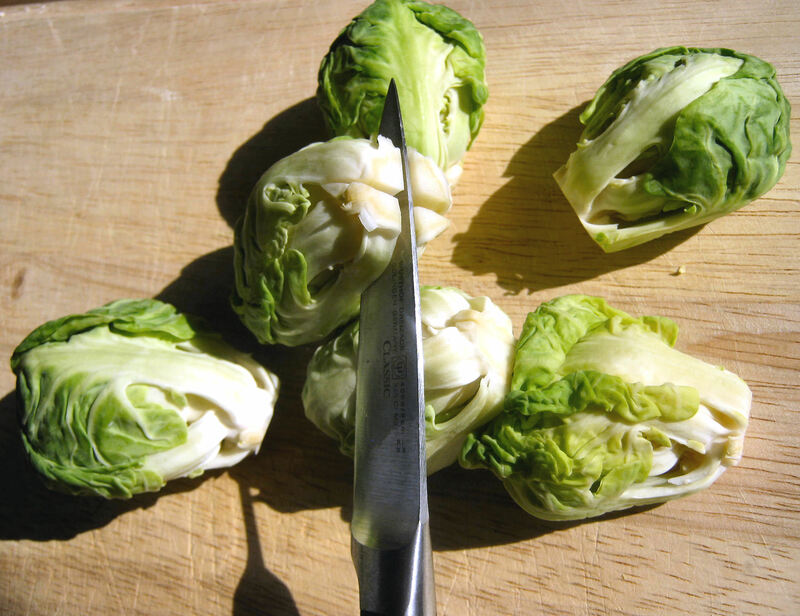 Rinse the sprouts and trim off the bottom 1/4 inch of their core, removing any loose outer leaves. Make an “X” in their cores with a small paring knife. Bring an inch of salted water to boil in a large pot. Add the sprouts in a single layer, cover, and cook for 2 to 3 minutes, or until the sprouts are just barely tender. 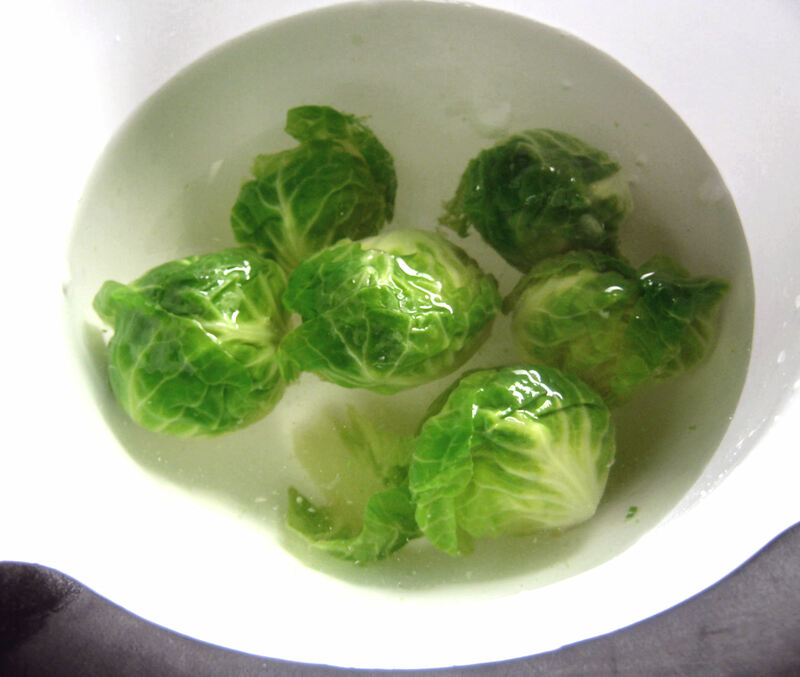 Drain the sprouts and plunge them immediately into a bowl of cold water. Leave them there for a few moments and then drain again. Cut the cooled sprouts in fourths, following the “X” as a guideline, and cut those fourths across in half (or thirds, if using really large sprouts). Place them in a large bowl and toss with the lemon zest, shallots, parsley and minced garlic. Make the dressing by whisking (or shaking in a small jar) the olive oil and lemon juice vigorously until thick and pale yellow. 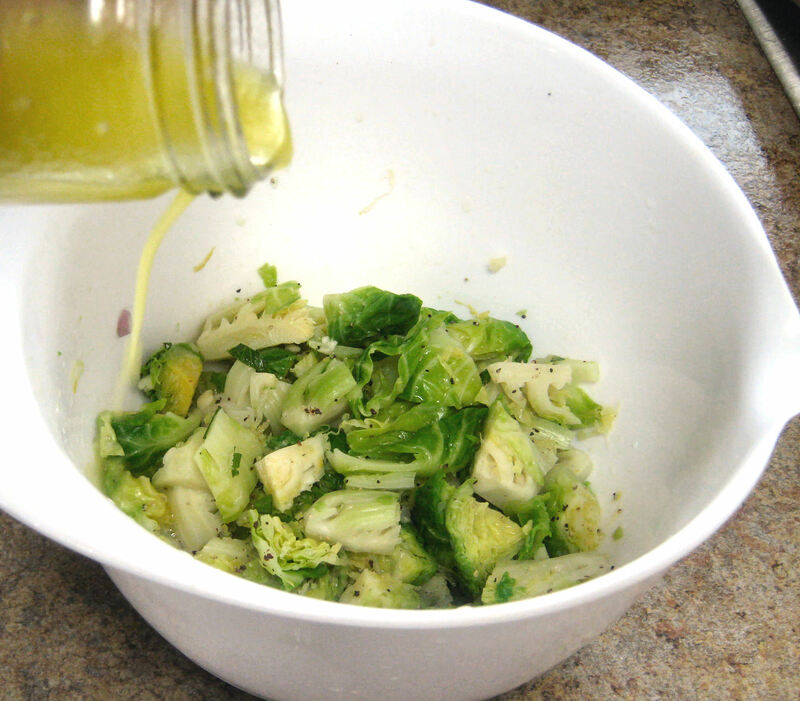 Pour the dressing over the sprouts and toss to coat. Season to taste with salt and pepper. Refrigerate for at least an hour, or even overnight for the best flavor. Serve chilled. These are really so easy to make that not much explanation is needed. First, get the ingredients ready. 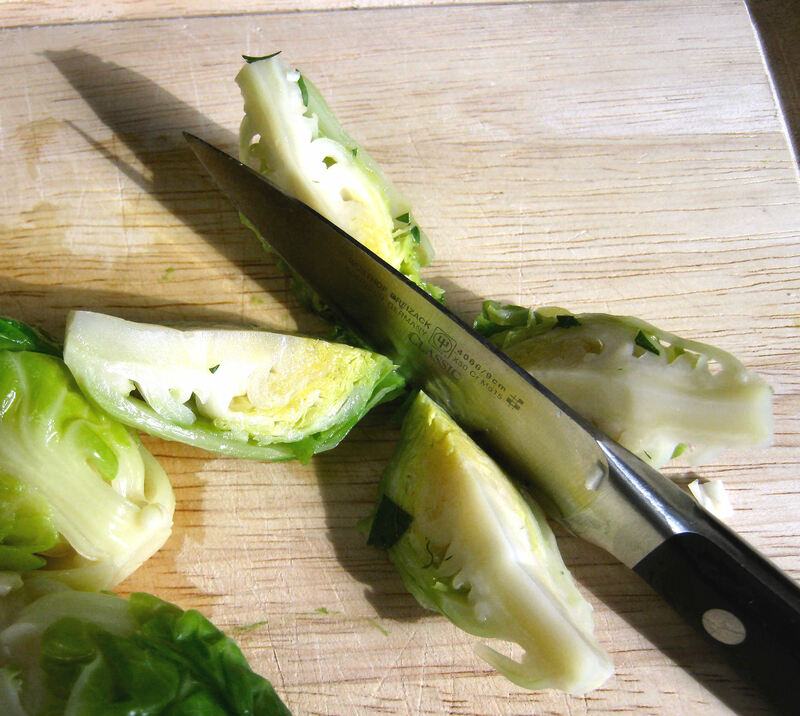 Rinse the sprouts and trim off the bottom ¼ inch of their core, removing any loose outer leaves. Make an “X” in their cores with a small paring knife. Boil them for 2 to 3 minutes or until just barely tender. You can stick them with a fork or knife to check. A little crunchy (in my opinion) will taste better than overcooked and soft. Drain the sprouts and plunge them immediately into a bowl of cold water. Leave them there for 2 to 3 minutes until cooled. 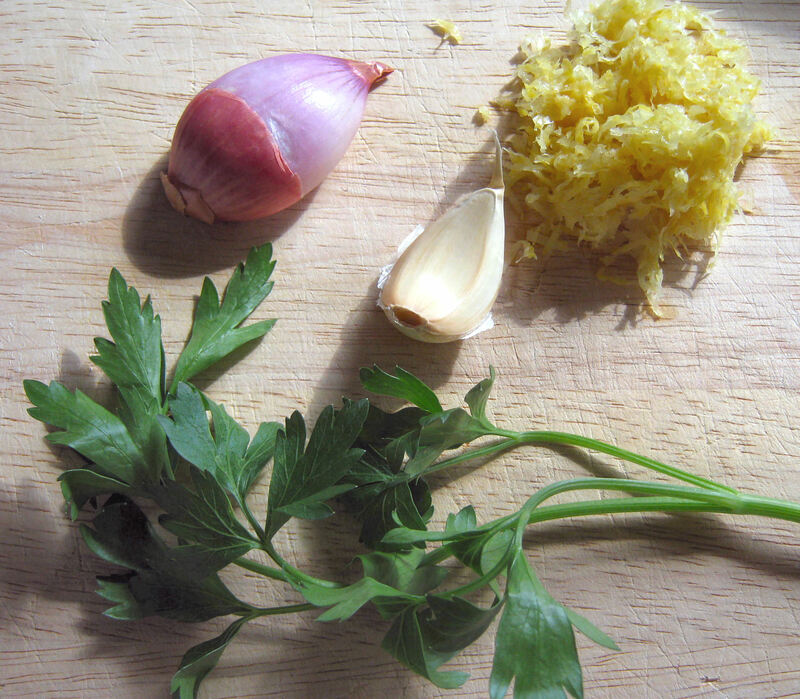 While the sprouts are cooking and then cooling, zest the lemon and cut up the shallots, parsley and garlic. Drain the cooled sprouts. Cut the each one in fourths, following the “X” as a guideline. Then cut those fourths each across in half. 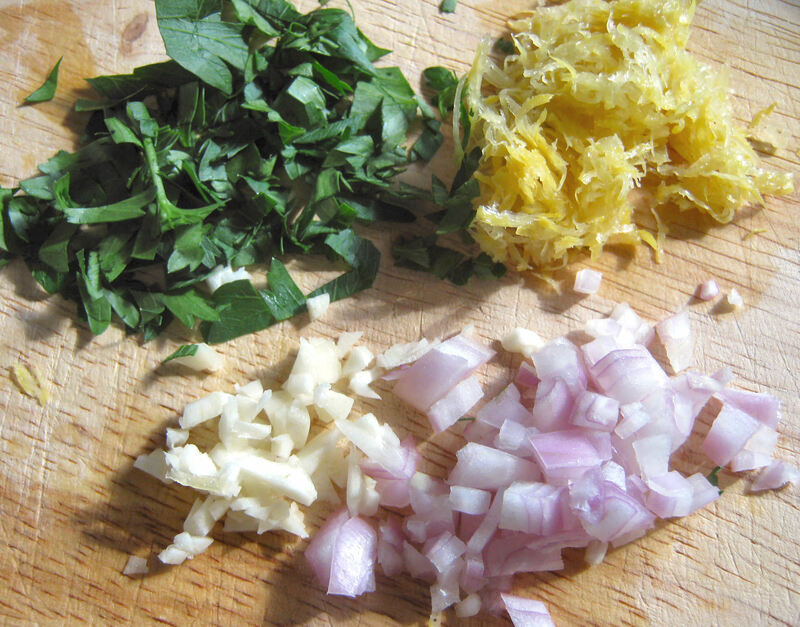 Place them in a large bowl and toss with the lemon zest, shallots, parsley and minced garlic. Pour the dressing over the sprouts. Toss gently to coat, and season to taste with salt and pepper. Refrigerate for at least an hour, or even overnight for the best flavor. Serve chilled and enjoy!